Buy more, save more. Your complete guide to Cyber Monday. Yes, we’ve gotten some work done. To celebrate our 10-year anniversary (this past August), Beauty Banter has decided to have a mini face lift, no knives necessary but lots of needles. I just wanted to take this opportunity to thank all of the loyal BB readers who have been with us from the beginning — and the new ones who come back daily to check out our posts. This site wouldn’t exist without your support… so thank you! I hope you enjoy Beauty Banter’s new look, and I urge you to stay connected on social media (Instagram / Facebook / Twitter) and to like, comment, and share your favorite posts. Take a look at our new shopping section of our favorite beauty products, tried, tested, and BB-approved! Have an idea for an article? Let us know in the comment section below. As always, we’re here for all of your beautifying needs. GIVEAWAY: Recreate Your Own Merged Braid And Win! I’ve teamed up with Refinery 29 and Regency Beauty Institute for a weekly beauty challenge with some pretty amazing prizes. This week’s challenge is the merged braid. Note: If you’re a braiding novice, don’t worry, this style can be achieved easily without ever french braiding! 1. 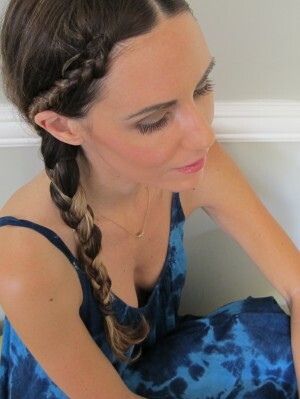 Working from a center of side part, take your bangs area, pull them to the right and braid. Secure the bottom with a rubber band. 2. Split your hair into pigtails. Take the left section of hair and braid. Secure with a rubber band. 3. Pull the braided left pigtail behind your head and over to the braided bang section and the unbraided right side of the pigtail. 4. Braid it all together into a side braid. 5. About mid braid you will notice that the rubber band from the left pigtail braid will budge through. Feel free to remover the rubber band and continue braiding. 6. Secure the merged braid and voila! – Easy as that, you have a gorgeous 3 braided ‘do. To follow the #ShareBeautyContest, click here. For more on the merged braid contest, click here. Rosacea Skincare Tips + Enter For a Chance to Win a Trip to the Emmys! Calm the Skin: Skin with rosacea is more sensitive and likely to react to ingredients in both prescription medications and skin care products, so talk to your dermatologist about what options are best for you. Moisturizers containing lipids, such as ceramides, are usually well tolerated and can improve the skin barrier, which is often compromised in people with this condition. Be Picky about Sun Protection: It’s a fact that daily sunscreen is a must, but not all sunscreens are created equal. Not only are some better than others, but many contain ingredients that can irritate sensitive skin with rosacea. The best bets if you are prone to rosacea, are sunscreens that contain transparent zinc oxide and moisturizing ingredients, like niacinamide, and are fragrance-free and non-comedogenic. Eat and Sleep Well, Stay Hydrated: It may sound basic but not getting enough sleep can make you look older because sleep is when your body repairs itself. Alcohol, sugary foods and processed foods can affect the skin’s ability to repair itself and cause premature skin aging, so try to eat a balanced diet and indulge rarely. For the occasional late night out, alternate a glass of water or carbonated water with every alcoholic beverage. I’m working with Galderma, the makers of Mirvaso® (brimonidine) topical gel, 0.33%*, on a program to educate people about treatment options for rosacea. 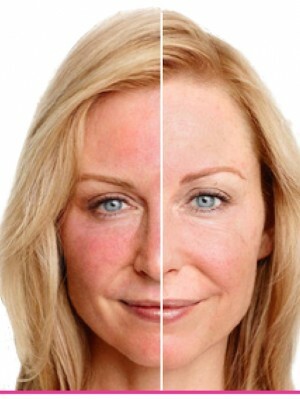 Mirvaso is the only FDA-approved treatment for the persistent facial redness of rosacea. Check out the below to learn more about Mirvaso and enter for a chance to win a trip to the Emmys! 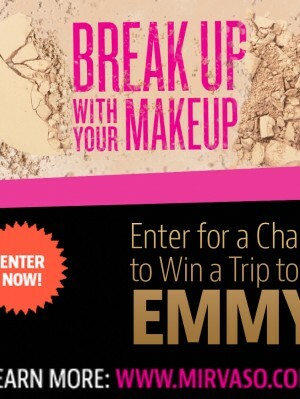 Giveaway: Win A Trip To The Emmys! This Award Season, you too can walk the red carpet. ENTER BELOW for your chance to win a trip to the Emmys, including airfare and 2 nights and 3 days in Los Angeles for you and a guest. Sweepstakes brought to you by Galderma, makers of Mirvaso® (brimonidine) topical gel, 0.33%*, the only FDA-approved treatment for the persistent facial redness of rosacea. My Proactiv + month challenge is nearing a close (recap here) and I’m so, so, so happy with the state of my skin! After almost a month, my complexion is less splotchy yet more hydrated – in that dewy, glowing way. My pores seem to have decreased and I’ve noticed that I’m breaking out less frequently. Overall, my skin looks ions healthier! Anyone who has suffered from acne can attest that a clear complexion can literally change your life (or, at the very least, your day!). For starters, you just feel cleaner. And happier. And you don’t need as much face makeup, definitely not as much cover up which is always a bonus, especially in the sweaty summer months. So, I wanted to offer one lucky reader the chance to win these stellar products… a 30-day supply that will get you on your way to clearer skin! Step 1: Skin Smoothing Exfoliator, a 4-in-1 daily face wash. Step 3: Complexion Perfecting Hydrator, a lightweight moisturizer with salicylic acid to hydrate while clearing up blemishes and diminishing pores. Leave a comment below with your name and email. Also, TWEET to @beautybanter using the hashtag #NoFilterProactiv. We’ll choose 1 winner on Tuesday July 8 at 12pm EST and notify you via email and twitter. *Only those who follow @beautybanter will be eligible to win. You must be a US resident to enter. Beauty Banter: What is Rosacea? BB: How do you know if you have rosacea? Dr.DD: “Rosacea can vary from person to person. It is classified into four subtypes according to signs and symptoms that often occur together. It is possible to experience characteristics of more than one subtype. 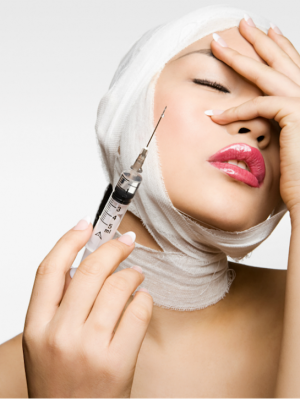 BB: How can you treat rosacea? You can learn more about rosacea, read about treatment options and view skincare tips from Dr. Doris Day below. Be sure to enter for a chance to get red-carpet ready and enter for a chance to win a trip to the Emmys!